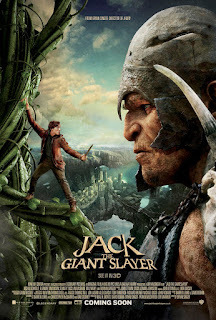 Synopsis: Young Jack (Hoult) takes some "magic beans" from a friar one day, but accidentally lets one get wet, causing an enormous beanstalk to sprout all the way to the land above the clouds where giants roam. Alas, a runaway princess was sheltering away from the rain in his house when it happens, forcing Jack to join the King's Elite Guard in a rescue attempt, and stop the king's adviser from using the giants to usurp the throne. Andrew: Hello readers! Earlier this week Sarah and I saw the new fantasy-filled action film for the whole family, Jack the Giant Slayer, starring Nicholas Hoult (Warm Bodies), Ewan McGregor (The Impossible), Stanley Tucci (The Hunger Games), Bill Nighy (The Best Exotic Marigold Hotel) and relative newcomer Eleanor Tomlinson. Sarah: It's a pretty big cast! A: A big cast for a big tent-pole film, and most notably this is the latest directorial effort from Bryan Singer, of X-Men and The Usual Suspects fame. We've seen the trailers and the promotions for this movie for a while now and to be honest, it didn't really look that good to me. S: No, I would agree with you somewhat. It seemed more fun to me, more of a no-brainer action flick than anything else. This didn't look like one where you would be forced as an audience to think very much. I don't think the trailers did a very good job promoting what the movie was going to be like. valiant effort, but it's not enough to carry a movie of this size. A: I think it was the fact that the giants didn't look good in the trailers. They were too computer generated. And the humor that they gave away in the trailers was just so-so. S: So now that we've seen it, what do you think? A: I actually very much enjoyed it! I think the trailers did it a disservice. What Jack the Giant Slayer ended up being was a very earnest, straight forward version of the story. It wasn't so much a retelling - it was almost like if you were never told the story before, this was their way of doing it. 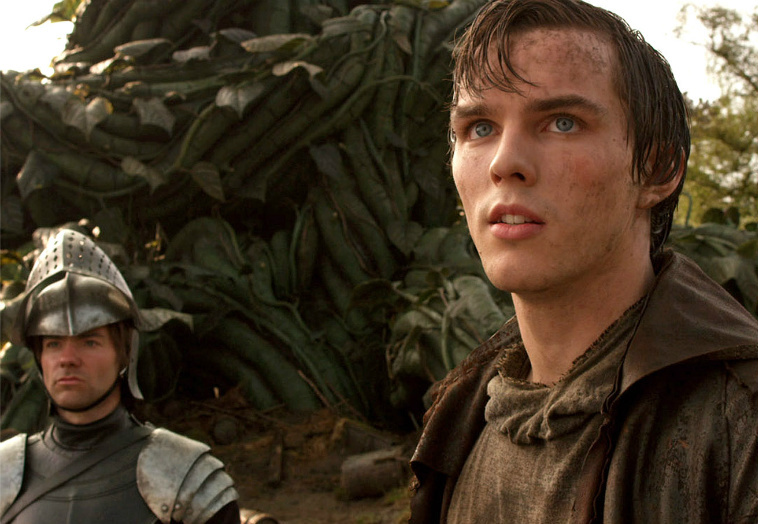 I liked Nicholas Hoult as Jack. I thought he did a fine job. There was a lot here to like from just a fun movie standpoint. It wasn't great, but I thoroughly enjoyed it for what it was. Although I still didn't really like the animation on the giants. S: And for being motion captured, they probably should have looked better. S: Well, interesting. I agree with you that it is a straightforward fairytale story. But I didn't really like it overall. S: I think it was because I was bored. I wanted more. I think the humor was completely given away in the trailers so nothing funny was fresh. And what other humorous parts there were, were groan inducing. I have to say, though, I was a little surprised by the violence. There was some creature violence that I wasn't really expecting. All animated of course but for a kid movie, for it to be there in the first place was surprising. A: These giants are not messing around! When they go after the humans, they go after them! S: They cut away of course right before you would see the eating of the humans but believe me, you got the full effect. A: There was one point where there is a big stampede scene and one of the main giants grabs a soldier in the king's army, bites off his head and then spikes the body on the ground! And the way one of the more prominent giants is done away with could give some kids some nightmares. S: I'm glad you mentioned that because along with those things, the main giant, played by Bill Nighy, was my biggest complaint. I will give you that his giant was the best created one, you can tell that they spent the most time on him, but I HATED his two headedness! S: HATED it!!! I thought that is was so offensive and unnecessary! Basically it was a mentally challenged conjoined twin that just moans and drooled throughout the whole movie! It was just awful! A: And I actually think it farted at one point, too. S: Yeah, I'm still a little confused on how that happened. A: A lot of jokes and gags like that were aimed at kids but for adults it really was cringe-worthy. S: I hated that giant. And I love Nighy! I think that he did a great job as the voice, I mean let's be honest that's really his strong point anyway as an actor. I was a little bummed that the whole movie was cringe-worthy because I really like all these actors! I think that Stanley Tucci was under-utilized and they just didn't do him any favors in this role. A: Honestly though I think what I liked best was the first act of the film. I love that it starts out with a young Jack and a young Isabelle are being read the same story about how King Erik the Great defeated the Giants, and it cuts back and forth between them being read the story by their respective parents. And basically everything leading up to them actually getting to Giant Land I thought was really well done and is the best part of the movie. As soon as the giants come into the picture, the whole thing goes to hell. 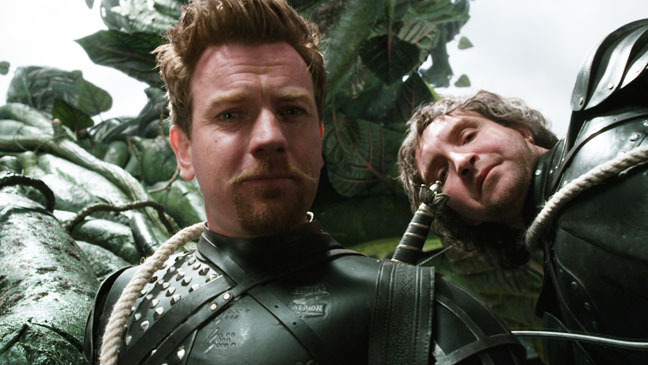 Ewan McGregor's Elmont, the leader of the King's Elite Guard, is one of the bright spots of Jack the Giant Slayer. A: And that taps into another reason why I relatively liked this movie. Unlike Hansel and Gretel: Witch Hunters or Van Helsing where they try and modernize the story while keeping it in it's own time period, this really was an earnest and straight forward period piece. S: I think why I liked the end so much was that it tied into our own history. These are our fairy tales. The stories that we were brought-up knowing. So while I didn't like this movie as a whole, there were reasons like that which reminded the viewer that this wasn't just directed by a Michael Bay or a Chris Columbus but by someone who knows how to handle his big budget movies. A: I liked it better than I thought it would be based on the trailers that we had seen. Now we did not see this in 3D the way that it is intended to be seen. S: Yeah but I really don't think we missed anything. You can usually tell when a movie would be good in it's 3D format and this wasn’t one of them. A: I agree. Directorially, I don’t think we really need to touch on too much, but I will say that I liked a sword fight between Tucci’s Roderick and McGregor’s Elmond. I really liked that. It was tight and the hand-to-hand combat was well done. Speaking of McGregor, he was probably my favorite part of the whole film because of his accent and humor. There aren't many great things about this film, but he's a shining spot. I'll say this last thing I want to touch on: this was another collaboration between Singer and screenwriter Christopher McQuarrie, who wrote The Usual Suspects and won the Best Original Screenplay Oscar for it, but since then they've worked together on Valkyrie and now this and both have been disappointing. S: The last question I have is: is this a family friendly movie? A: To a certain extent, yes. You have to know your kids. Anything under 9 or 10 might be a little upset by some of the violence. You really do need to know your kids. So our final thoughts? S: Good to take some kids if you need to get them out of the house, otherwise you really don’t need to see this one in theatres. It doesn’t really lend itself to a big screen experience. It’s a bit dumb and silly, but that’s all of the fun with this movie and that’s all that mattered to me when I was watching this. Nice review. Definitely a popcorn flick if there every was one for the time of year it came out.